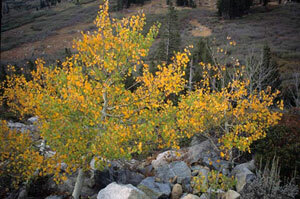 Library image #2036: Aspen along the Pacific Crest Trail, Five Lakes Creek, Tahoe National Forest. The United States Congress designated the Granite Chief Wilderness (map) in 1984 and it now has a total of 28,374 acres. All of this wilderness is located in California and is managed by the Forest Service. Located at the headwaters of the American River, the Granite Chief was designated a Wilderness area because of its pristine nature, natural beauty, and potential to provide primitive, non-motorized recreation opportunities. The Wilderness reserves a scenic area of exposed rock formations, granite cliffs, and glacier-carved valleys, forests, and meadows. The southern section is blanketed with a thick cover of trees: red fir and lodgepole pine higher up, and a mixture of deciduous and evergreen woodlands lower down. Several major streams drain the area. The northwest section of the Wilderness is part of the French Meadows Game Refuge. The area is served by a substantial trail system used by hikers and equestrians for recreation activities. Most of the use originates from the east or Lake Tahoe side because of the ease of access and because of the population and recreation visitor base. A number of trails provide access to the Wilderness. The Pacific Crest Trail crosses the area north-south for about 21 miles along the eastern boundary passing through Five Lakes Basin, where no camping is allowed within 600 feet of the water. The Five Lakes Trail crosses near the middle of the Wilderness, and from the Basin, follows Five Lakes Creek for about nine miles to Hell Hole Reservoir. Away from Five Lakes, the Wilderness receives light human use, a great attraction for solitude seekers. Elevations in the Granite Chief range from 5000-foot valleys to 9000-foot peaks. Summers are typically warm and dry, though nighttime temperatures can be cold and afternoon thunderstorms often build over the mountains. Snow is possible any month of the year. Be prepared for changeable weather and bring clothing that will keep you warm and dry. Planning to Visit the Granite Chief Wilderness? How to follow the seven standard Leave No Trace principles differs in different parts of the country (desert vs. Rocky Mountains). Click on any of the principles listed below to learn more about how they apply in the Granite Chief Wilderness.